Many people have been citing a 2008 article in Rossiiskaya gazeta. This is a paraphrase of the “Social and Economic Development Strategy to 2020,” drafted at the time by the Russian Economic Development Ministry. The Economic Development Ministry was wrong, of course, but the experts were right. Russia has already established itself as a world power, albeit in roughly the same sense as North Korea and Iran. It has gone even farther. Iran and North Korea, at least, are not in everyone’s face all the time, while Russia butts in everywhere nowadays. We should look for the root of the Economic Development Ministry’s mistake in the machinations of Russia’s enemies, of course, although the reason Russia has so many enemies is to be sought in the circumstances that also explain its promotion to the same league as North Korea and Iran. That is the intriguing dialectic at work here. Wages in Russia are higher than those in the other CIS (Commonwealth of Independent States) countries and comparable with those in Central and Eastern European countries. Those are the findings of the experts at the Higher School of Economics (HSE) who have issued the report “Wage Comparisons among Countries in 2011–2017.” They used purchasing power parity (PPP) indicators to do their calculations. As 2017 came to a close, Russia was the leader in terms of wages among the CIS countries. Taking PPP into account, the average monthly wage in Russia last year amounted to $671. Kazakhstan lagged behind this benchmark less than the other CIS countries. Its average monthly wage in 2016–2017 was $459 and thus lower than the average wage in Russia by 30–40%. Tajikistan was the farthest behind, with an average monthly wage of $147. The study’s authors note the wage gap between Russia and the other CIS countries has continued to widen since 2011. In particular, this has been due to a deterioration of economic conditions in Azerbaijan, Belarus, and Kazakhstan in 2015–2017. However, Russia’s position looks less attractive when compared with other groups of countries. Thus, among the countries of Central Europe, the level of wages in Russia is comparable only with Romania ($678 a month) and Bulgaria ($602 a month). The average monthly wages in Czech Republic and Croatia, for example, are considerably higher than the average monthly wage in Russia (by 80–90%), despite a downward trend in wages that has been observed since 2011. There is also a considerable gap between wages in Russia and wages in Poland and Hungary. In 2017, they outpaced Russia by 60–70%. Among the BRICS countries, Russia exceeds the same indicator for Brazil by 5%. This gap has been narrowing in recent years, however. Wages in China outpaced wages in Russia as early as 2014, and the gap between the two countries is now almost 30%. In the long term, as the HSE’s Svetlana Biryukova, the report’s co-author, explains, if the current wage trends in all the countries, including Russia, continue, Russia would retain its leadership only among the CIS countries, but would find itself in last place among Central and Eastern European countries. An SMS poll conducted by Russian Public Television (OTR) has shown that the average monthly wage in Pskov Region is two times lower than the official figures, amounting to 9,950 rubles [approx. 160 euros]. These figures were published by OTR’s news service on the basis of information sent by viewers. OTR viewers reported their minimum and maximum monthly wages: they amounted to 6,500 rubles and 15,000 rubles, respectively. According to Rosstat, the average monthly wage in Pskov Region amounts to 22,264 rubles [approx. 358 euros]. The poll showed that the average monthly wage in Russia is 15,158 rubles [approx. 244 euros], which is also two times less than the official figures. Rosstat reported that the average monthly wage this year has amounted to 36,746 rubles [approx. 590 euros]. According to Rosstat, the poorest region is Dagestan. The average monthly wage in the country’s wealthiest regions—Murmansk, St. Petersburg, Yamalo-Nenets Autonomous District, Khanty-Mansiysk Autonomous District, Sakhalin, Kamchatka, Moscow, and Moscow Region—is over 40,000 rubles per month [approx. 640 euros]. According to OTR’s survey, only viewers in Moscow, Moscow Region, Buryatia, Ingushetia, the Maritime District, and Belgorod Region make over 30,000 rubles a month. Viewers in Kabardino-Balkaria, Kursk Region, Orenburg Region, Pskov Region, Saratov Region, and Tver Region make less than 10,000 rubles a month. The lowest monthly wage was discovered in Novgorod Region. A postman there makes 2,800 rubles a month [approx. 45 euros]. Translated by the Russian Reader. Thanks to Comrade Koganzon for the heads-up. See “Russia’s Economic Performance: Fudging the Stats” (February 16, 2017) and “Alexei Gaskarov: A 25,000 Ruble Minimum Monthly Wage Is a Good Idea” (February 9, 2017) for more perspectives on these issues. How would a high minimum wage help Russia turn into a developed country? Why is Alexei Navalny’s campaign pledge not stupid at all? Financial analyst Alexei Gaskarov shares his opinion. Russia ranks at the very top in international ratings of social inequality. There are different means of combating inequality, including progressive taxation and raising unemployment benefits. But as soon as someone proposes a solution to the problem, he is immediately dubbed a populist. This fate has befallen Alexei Navalny. In his presidential election program, he proposed setting a minimum wage of 25,000 rubles a month [approx. 400 euros at current exchange rates]. Let’s see how the structure of Russia’s GDP would change if this measure were implemented under current macroeconomic parameters. And let’s compare Russia’s GDP with the GDPs of the G20 countries. GDP is the market value of all goods sold and services rendered in the country during the year. Costs are always someone’s income, so GDP can be calculated not only in terms of consumption, investment, government expenditures, and net exports but also in terms of income. Compensation of employees, includes expenditures on insurance and pensions. Net taxes on production and imports. Essentially, this is revenue from the extraction of natural resources and their subsequent import abroad. Business income: company profits, capital gains, incomes of individual entrepreneurs. The table shows that business income is nearly equal to the income of all employees. Indirect taxes (e.g., income tax and VAT) are not included in GDP in order to avoid duplication, since they are based on the same profits and wages. 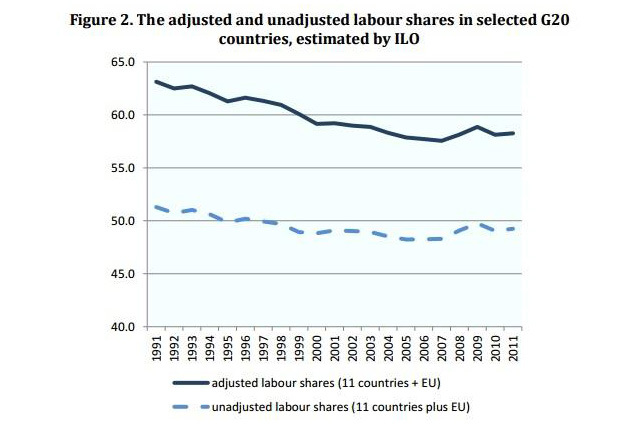 The labor share in Russia is 6–7% lower than the average for the G20 countries. The reason for the difference is the weakness of democracy and civic institutions in Russia. Election results do not depend on the opinion of the populace, trade unions are weak, and protests against social policy are far and few between. So it makes no sense to redistribute incomes to benefit employees. How Much Would We Spend? 72,323,000 people are employed in Russia. We have to subtract entrepreneurs [i.e., the self-employed] from this figure. According to the Unified State Register of Individual Entrepreneurs (EGRIP), they amount to approximately 3.5 million people. We also have to subtract those people who work part-time: according to Rosstat, there are around one million such people, if we discount those involved in small business. So the upper limit of full-time employees in Russia is 67,820,000 people. Within this group, 50.3% earn less than 25,000 rubles a month. However, 1.4% of employees earn between 5,000 and 5,000 rubles a month, and 20.9%, between 17,000 and 25,000 rubles a month. Another 50 percent of employees receive an average monthly wage of 15,329 rubles [approx. 240 euros]. Accordingly, the poorest wage earners would benefit most of all from the introduction of a mandatory minimum wage. On average, every employee currently earning less than 25,000 rubles a month would be paid an additional 9,671 rubles (i.e., 25,000 rubles – 15,329 rubles = 9,671 rubles ). We would thus have to reallocate almost 3.96 trillion rubles annually: 9,671 rubles (the average pay rise) x 67,820,000 (the number of employees) x 50.3% (the share of those currently earning less than 25,000 rubles a month) x 12 (months) ≈ 3.96 trillion rubles. Let us add in insurance premiums and pension contributions, which amount to 30.2%. The overall total would be around 5.15 trillion rubles (3.96 trillion x 1.302). Russia’s GDP in 2015 was 83.23 trillion rubles. If we reallocate 5.15 trillion rubles from profits to wages, we arrive at the following ratio. In the resulting structure, the share of labor income is slightly higher than the average figure among the G20 countries. Obviously, many people would lose their jobs after a minimum wage of this kind was introduced, primarily those people who dig pits with a shovel where an excavator should be doing the work. These jobs are safe nowadays only because you can pay people almost nothing in Russia. In turn, employers would seek to maintain profits by increasing prices for finished products. In aggregate, these effects would shape an economy typical of developed countries. Many people fear inflation. Let’s evaluate the risks. To introduce a mandatory minimum wage of 25,000 rubles a month, according to the structure indicated above, we would have to increase wage costs by 13.7%. The share of labor costs in the economy is 45%. Accordingly, to cover the increased costs, the price of finished products would have to be increased by 6.165% (13.7% x 45% = 6.165%). That would be the upper limit of possible inflation. In reality, however, a rise in prices decreases consumption and forces prices to creep downwards. In addition, unemployment and inflation are inversely proportional to one another, meaning the higher the unemployment rate, the lower the rate of inflation. Additional inflation would be two or three percent, and for the most part it would be spread out over the whole of society, meaning that people who earn a lot would forfeit this percentage of income, while the incomes of the poorest workers would increase significantly. Of course, such a drastic rise in wages is a rather radical measure, given that the minimum wage is currently even below the subsistence level, and it is bound up with a variety of social benefits that would also automatically increase. But the tenor of the reform is absolutely correct and corresponds to successful examples in world practice. The introduction of a statutory minimum wages in Germany has lead neither to inflation nor unemployment. In the US, increases in the minimum wage have increased the salaries of low-paid workers while maintaining employment. Translated by the Russian Reader. Thanks to Alexei Gaskarov for the heads-up. For another take on the Russian economy’s performance and the figures provided by Rosstat, see yesterday’s featured post, “Lies, Damned Lies, and Statistics,” a translation of an op-ed piece by liberal economist Sergei Aleksashenko. Pollocracy continues its triumphant march across the sweeping plains and endless forests of the world’s largest country, stamping out the last vestiges of real reality there. Less than a month before nationwide elections to the Russia State Duma and regional legislative assemblies, on September 18, 2016, the Public Opinion Foundation (whose Russian abbreviation FOM should be changed to FOAM) has published the results of a new survey, according to which more than fifty percent of Russians believe the country’s economic situation is satisfactory. At the same time, reports RBC, 44% of respondents said depositing money in Russian banks was a reliable way of saving it. This astounding victory for what the FOAMsters euphemistically call “sociology” comes amidst a spate of bank license revocations by the Russian Central Bank, a hunger strike by miners at Rostov mining company King Coal, who have not been paid back wages amounting to over 4.1 million euros since May 2015, and an abortive attempt by Krasnodar farmers to drive their tractors in a convoy to Moscow to protest the parceling off of prime land by authorities in the region to big agribusinesses instead of to them. And those are just the recent “economic achievements” that came immediately to mind when I saw those dubious poll results. There are hundreds of more such examples that I could adduce, starting with the fact that there have been more than a few reports in the media and elsewhere about a decline in the real wages and income of Russians over the past couple of years. In 2015, the average Russian salary, in terms of US dollars, was equal to the level of wages in Kazahkstan, according to data from the Higher School of Economics (HSE). Compared to 2014, the salaries of Russians dropped by almost a third last year. The observed decline in wages in Russia has led to their drawing level, late last year, with average wages in Belarus and Kazakhstan in previous years, experts at the HSE have calculated in their May monitoring of the populace’s socio-economic status and social well-being. Computed on the basis of exchange rates, the average wage in Russia last year was $558 a month, which is lower than the 2014 level by 34% or more than a third. By way of comparison, in Kazakhstan and Belarus, the average monthly wage, calculated using the same method, was $549 and $415, respectively. From 2011 to 2015, Russia had the highest level of wages in the CIS, but in 2014, compared with 2013, it dropped by nearly 10%, from $936 to $847. The experts at the HSE note that the gap in economic performance indicators between Russia and certain CIS countries has been constantly contracting. For example, the average salary in Armenia in 2008 was around 52% of the 2015 Russian wage, but by the end of the period in question, it had grown to 60%. During the same period, Belarus has gone from 61% to 75%, and Tajikistan, from 17% to 26%. However, over the same period, the relative positions of Azerbaijan, Moldova, Ukraine, and Kazakhstan have declined. If we compare the average wage in Russia and Central and Eastern Europe, the wage in those countries has exceeded the average in Russia for the past five years. Thus, last year, the average Russian wage came to 60% of the average wage in Hungary, and 50% of the average wage in the Czech Republic. However, in 2015, Russia came close to the level of wages in Bulgaria during 2013–2014. Trends in the average monthly wage in Russia, Brazil, and China over the past five years show that wages in Brazil were higher than in Russia last year. Despite the fact that data on wages in China for 2015 have not yet been published, the figures for Russia in 2015 were lower than for China in 2012, 2013, and 2014, indicating the gradual reduction of the gap between the two countries in terms of this indicator. Last week, Sberbank also reported a fall in the average monthly Russian wage below China’s average wage. The bank’s principal analyst, Mikhail Matovnikov, cited data that the average monthly wage of Russians had fallen below $450 a month, lower than that in China, Poland, Serbia, and Romania. Translated by the Russian Reader. Thanks to Valentin Urusov for the heads-up.